wrote Johann Wolfgang von Goethe in a letter to his friend Charlotte von Stein during his stay in Bern in 1779. Today the Swiss capital or “federal city” still enchants its visitors with its charm. It is the fourth largest city of the country (ca. 140’000 inhabitants; 400’000 incl. urban agglomeration) and located in the German speaking part of Switzerland. 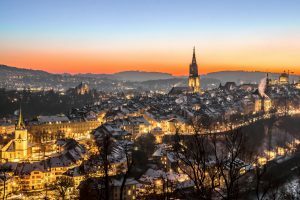 The Old Town of Bern was declared to be part of UNESCO World Heritage as early as 1983. The University of Bern was founded in 1834 (replacing a Theological Seminary of the 16th century). Today, it is the third biggest university in Switzerland with around 17’500 students. It offers a broad choice of courses and programs in eight faculties and some 150 specialized institutes. The Institute for the Science of Religion was founded in 1991 and is part of the Department of Art and Cultural Sciences.